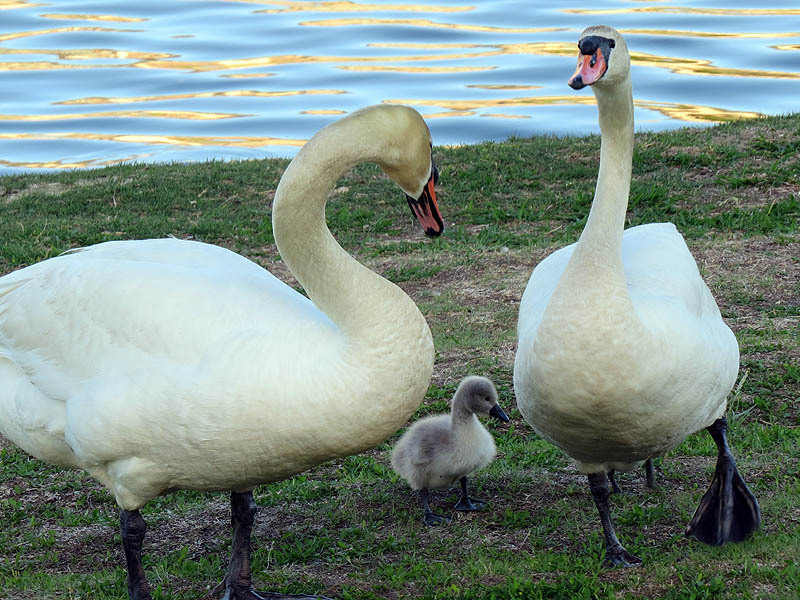 Its been a few weeks since we last checked in on the Mute Swan family at Josey Ranch Lake Park. I stopped by briefly this weekend to see how our now 14 week old Mute Swan cygnet was doing, and I found that he was doing well. 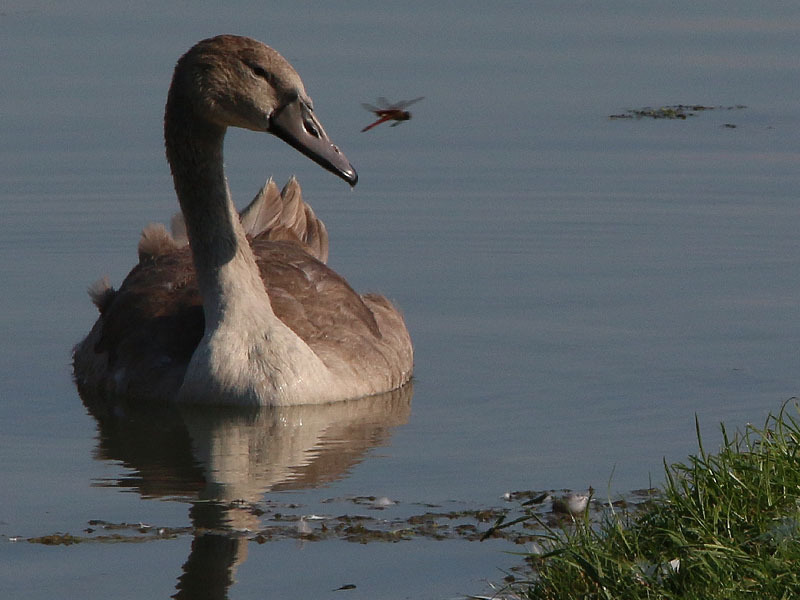 It is stunning to see how much this juvenile swan has grown in just 14 weeks. The before and after photographs below will give you some idea of how far the young swan has come. This is how you convert mass amounts of aquatic vegetation into a full grown Mute Swan! The Mute Swan cygnet 14 weeks ago. 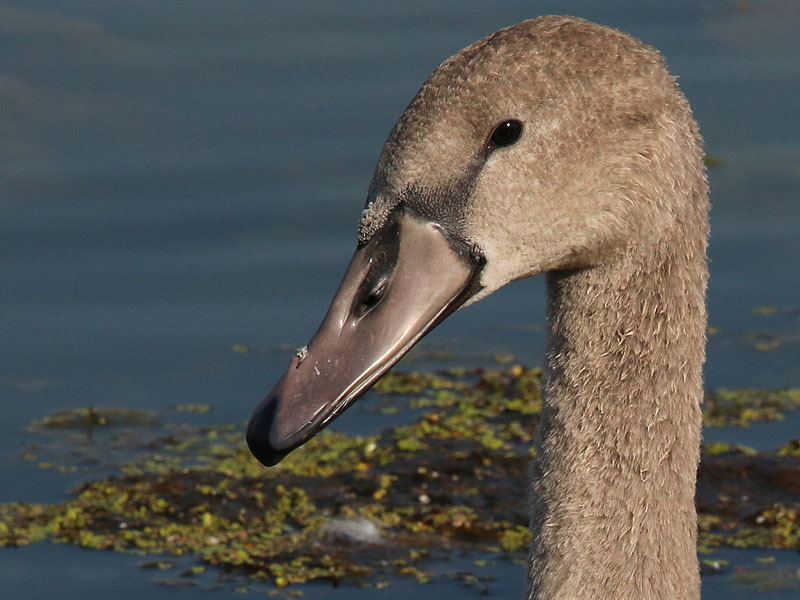 The Mute Swan cygnet today. 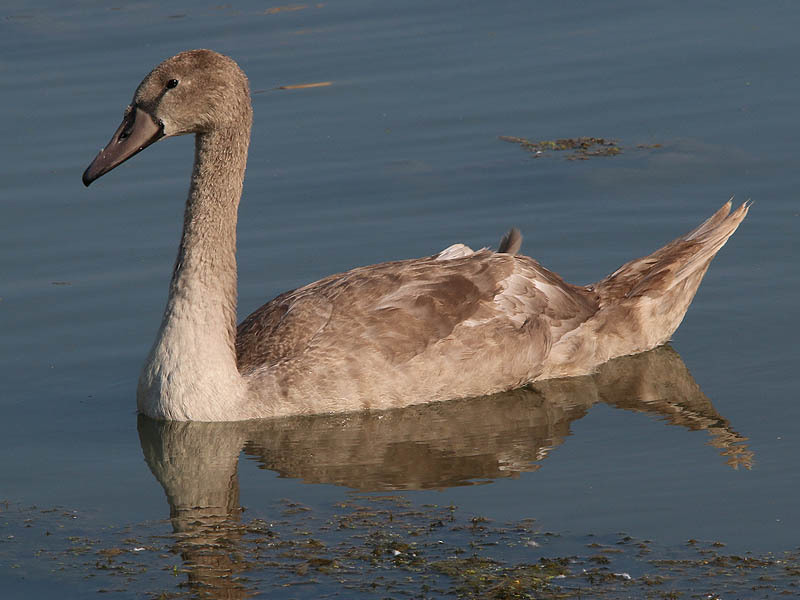 With each passing week the young cygnet becomes more and more independent. He no longer requires the constant supervision from both his parents that characterized his younger days. Early on this visit I watched as the juvenile swam about by himself at the water’s edge while both parents kept watch from dry land. 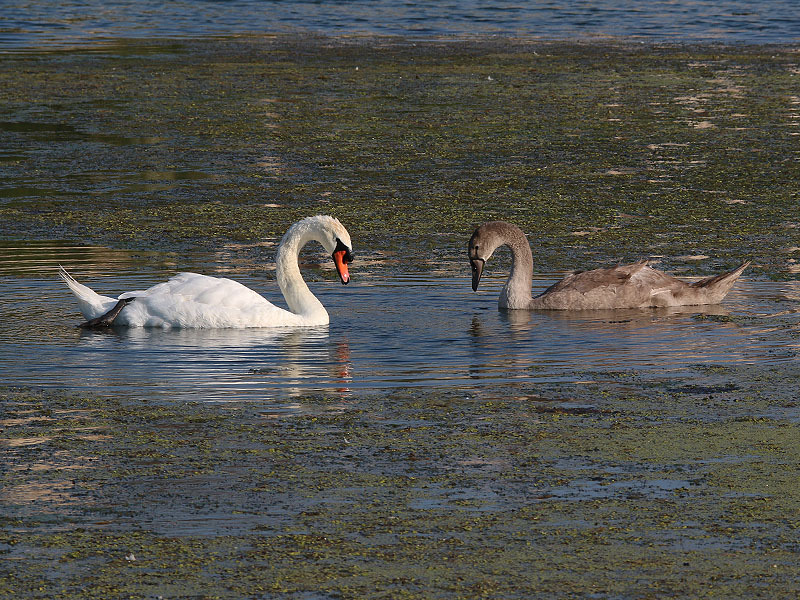 Later the cygnet and his father went out to feed in the open water, while mom stayed behind to preen. The father and his offspring feeding together. 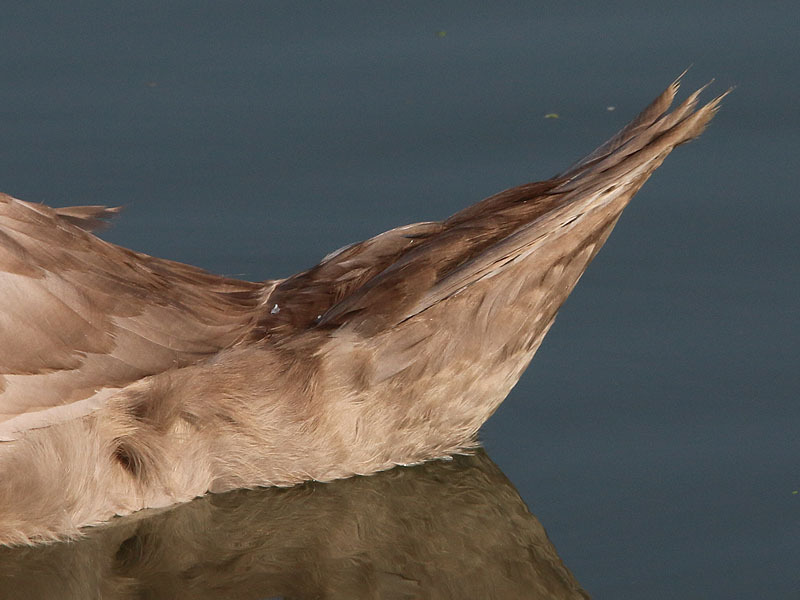 Mom was on shore preening. 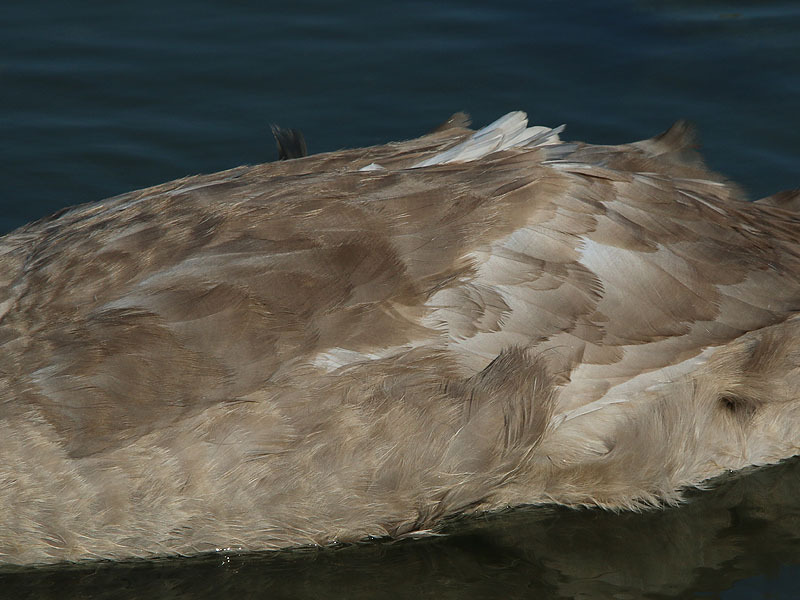 The Mute Swan cygnet at 14 weeks of age. The young bird is becoming more independent with each passing week. He is beginning to develop the profile of an adult bird. As always, a good measure of the cygnet’s progress comes from a close examination of his feather growth. As you can see in the following pictures the young swan is very nearly fully feathered now. 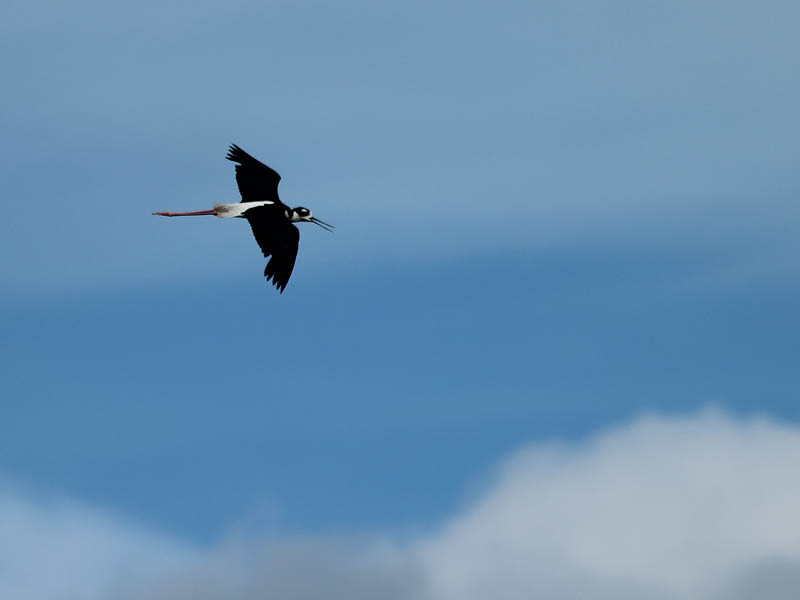 I will be looking for an opportunity in the coming weeks to catch the juvenile exercising his wings. With a good look at his flight feathers we may be able to develop a reasonable estimate for when this young bird might first take to the air. His wing feathers are coming in nicely. 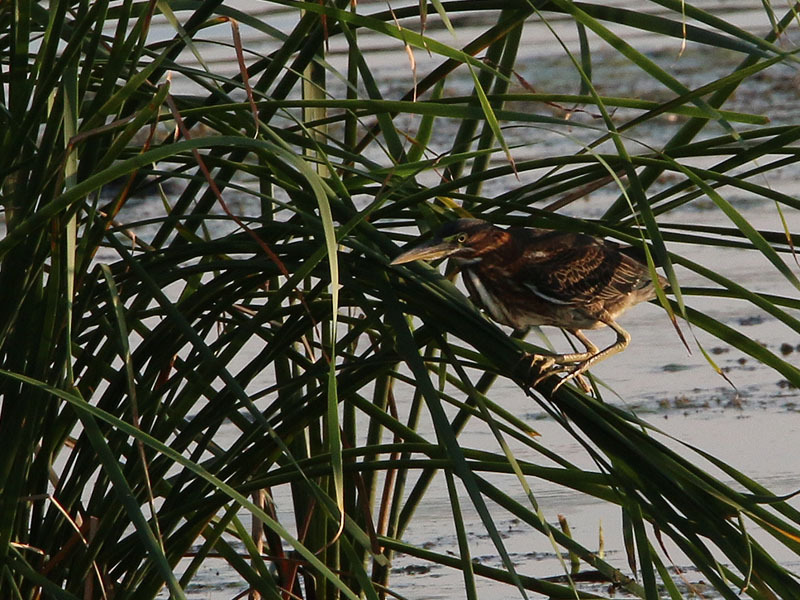 As are the young bird’s tail feathers. 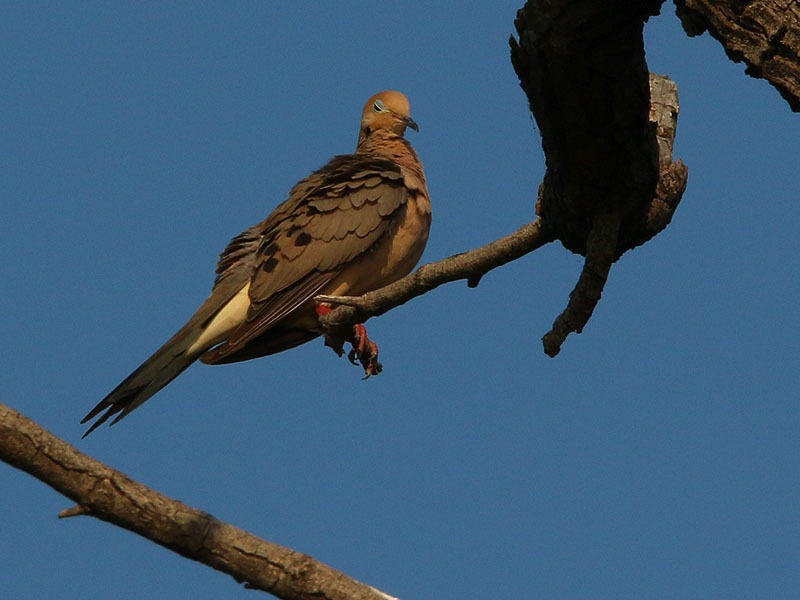 Some white feathers are visible near his tail. 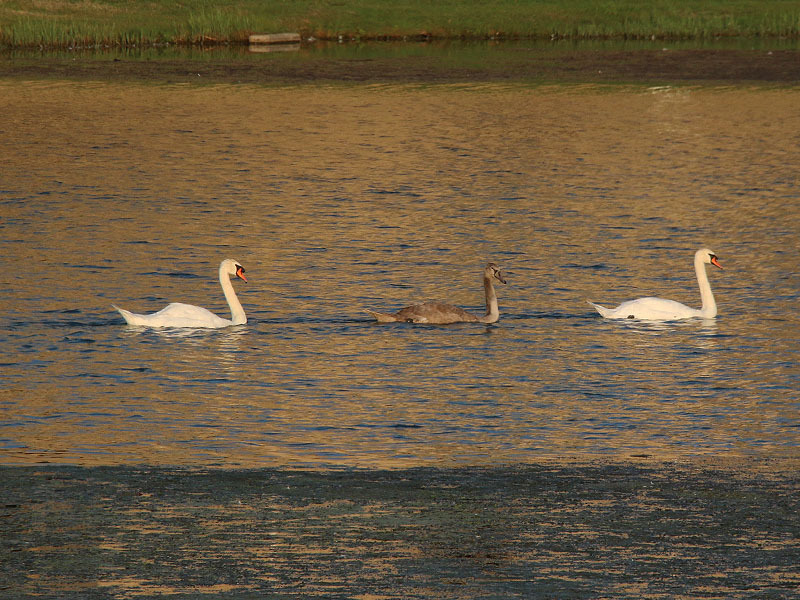 The Josey Ranch Lake swan family. 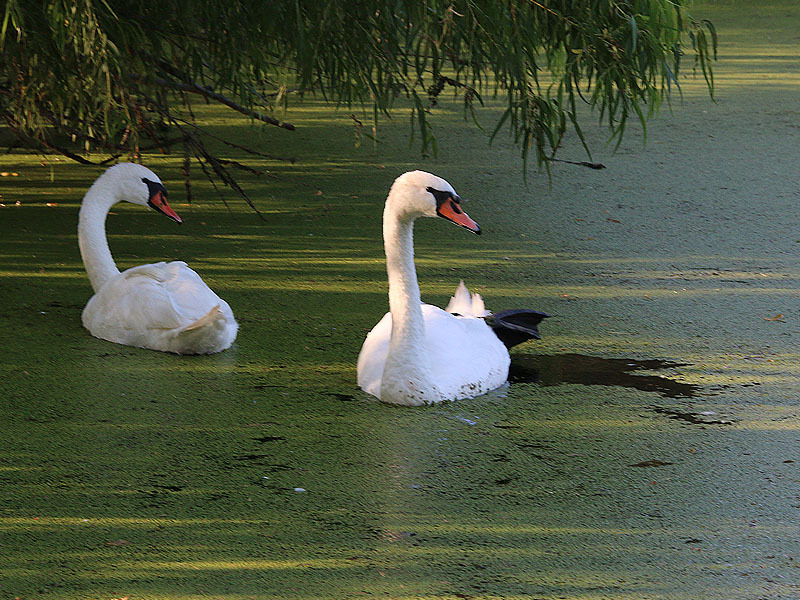 There is a second pair of Mute Swans that also spends time at this park. You can see pictures of them below. 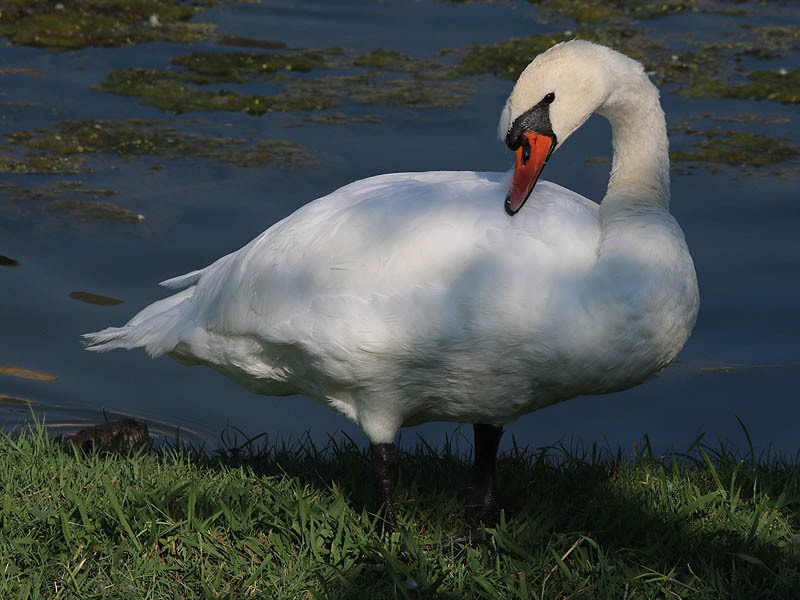 These swans generally restrict their activities to a pair of smaller ponds located to the southwest of the main lake. On rare occasions one of these swans will wander over to the bigger lake. 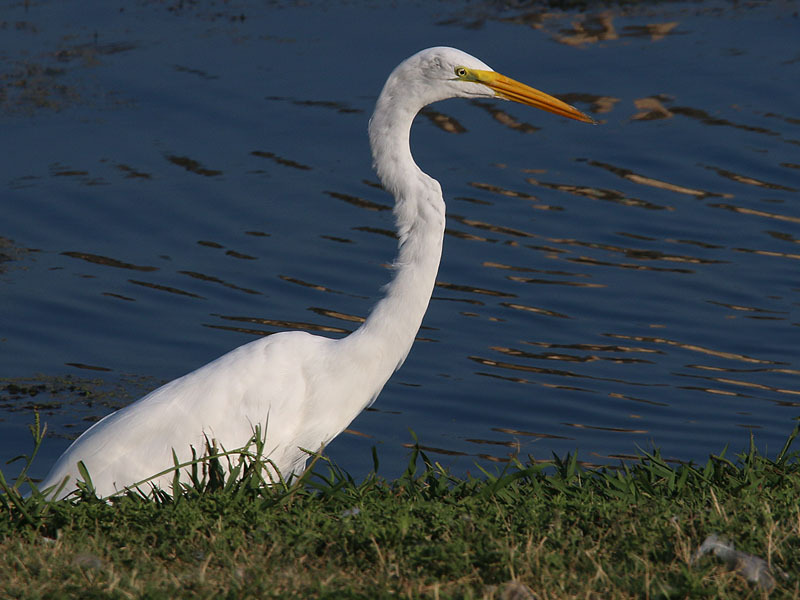 When they do, they usually come into immediate conflict with the swan family living there and are promptly run off. 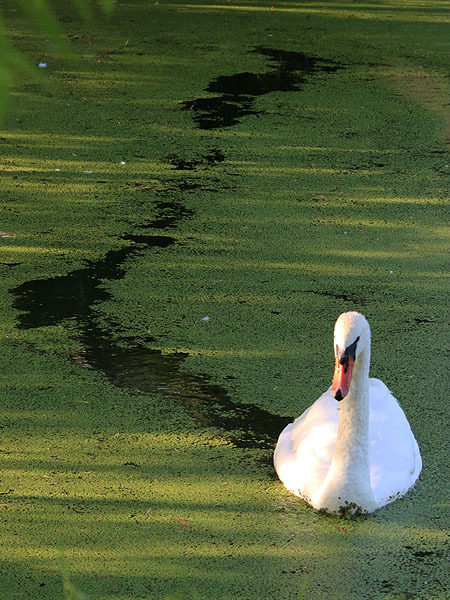 Mute Swans are very territorial. These two swan produced no offspring of their own this spring. 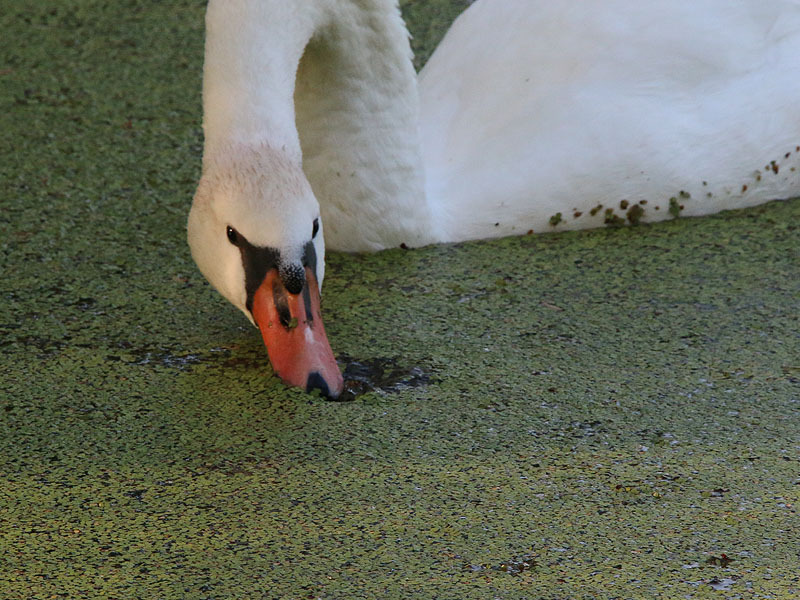 The habitat around the ponds they spend their time in does not appear to be well suited for nesting Mutes Swans. 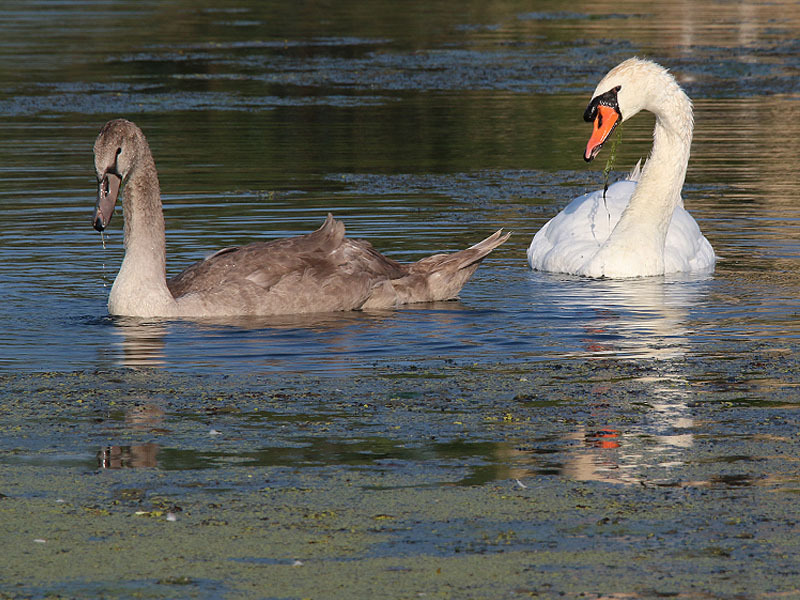 It is also unclear whether these two swans are related in any way to the mated pair living on the larger lake. A second pair of Mute Swans. These birds have no offspring this year. 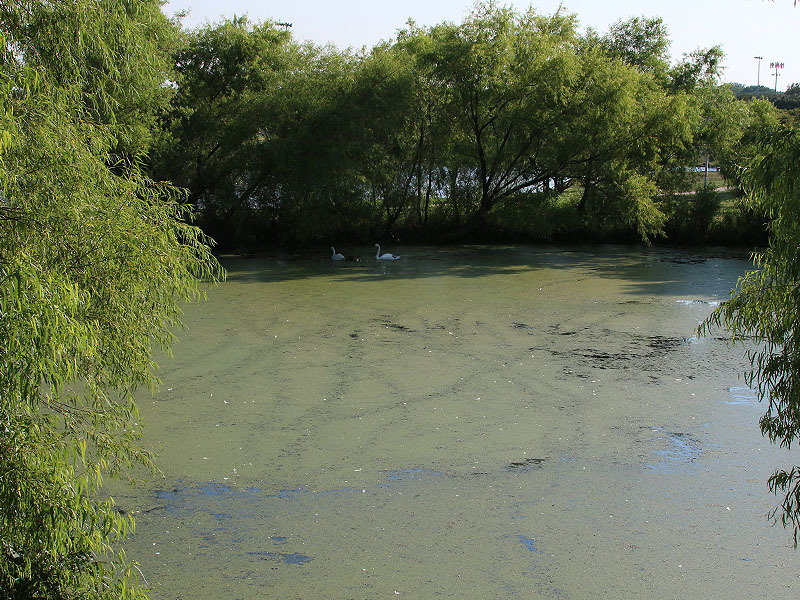 Duckweed covered the entire surface of the small pond. When it comes to urban wildlife, this park always delivers. 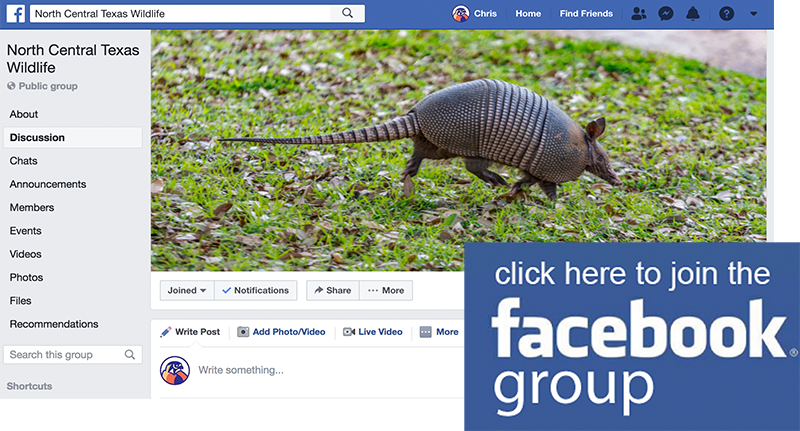 It is a very productive place to observe and photograph wild animals engaged in candid behaviors. Every week, after I finish photographing the swans, I make my way around the rest of the park just to see what I can see. I always end up staying much longer than I intended and this week was no exception. 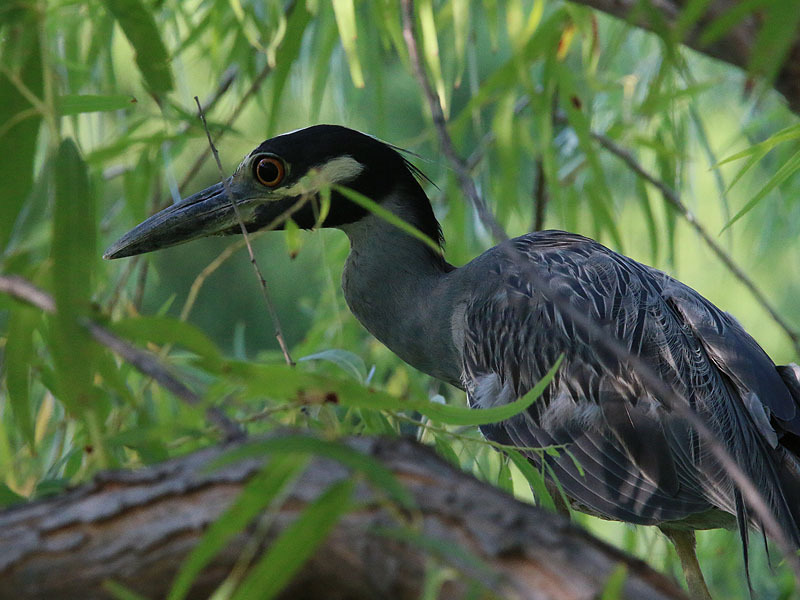 As always, birds of the heron family were well represented at the park. 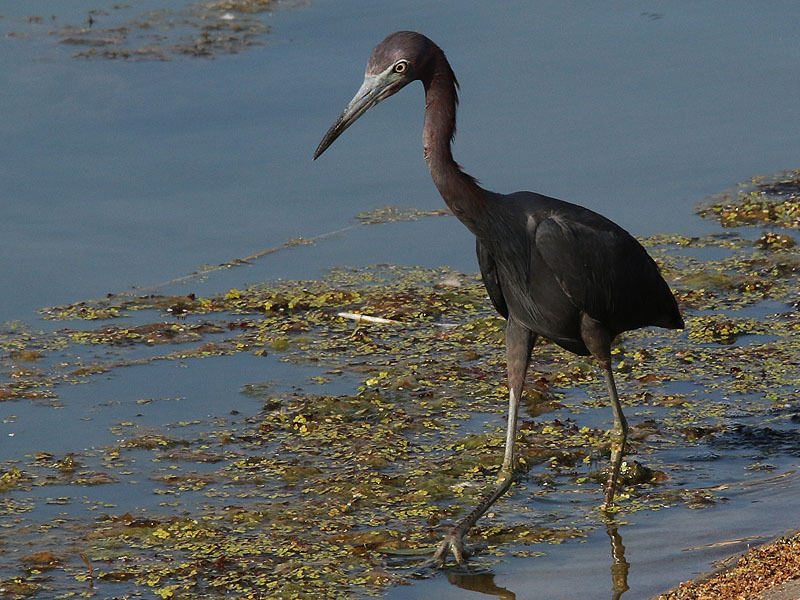 See below for pictures of a Great Egret, a Green Heron, and Little Blue Heron, and a Yellow-crowned Night Heron. 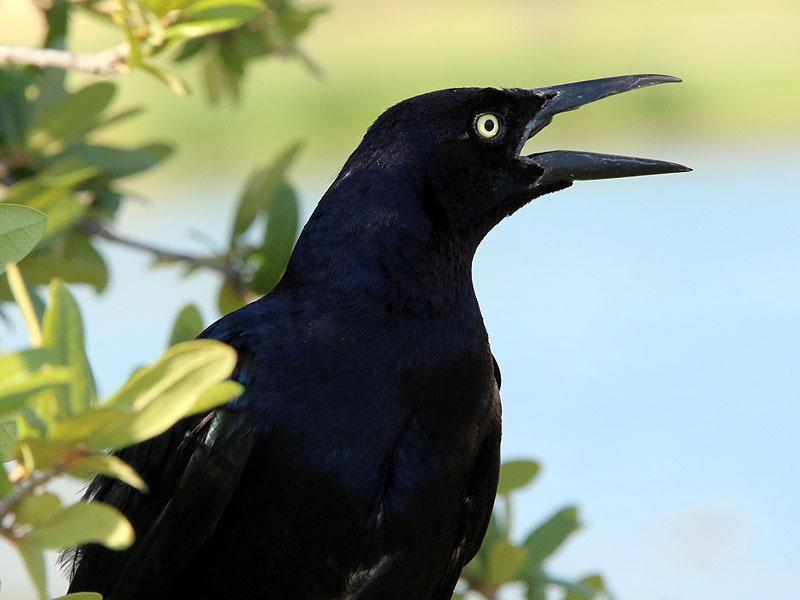 Other birds present at the park on this sunny afternoon included a plethora of Great-tailed Grackles and a nearly equal number of Mallards. As I have noted in the past, breeding season has nearly come to and end for the resident Mallard, most males are now sporting their eclipse plumage. There are still a few juvenile ducks at the park, and most are very bold about approaching people. They have learned at a young age that many visitors to the park come bearing gifts of bread! Also present this week were a few new domestic ducks that I have not seen at the park in the past. Two Pekin Ducks and one Magpie Duck have taken up residence since my last visit. 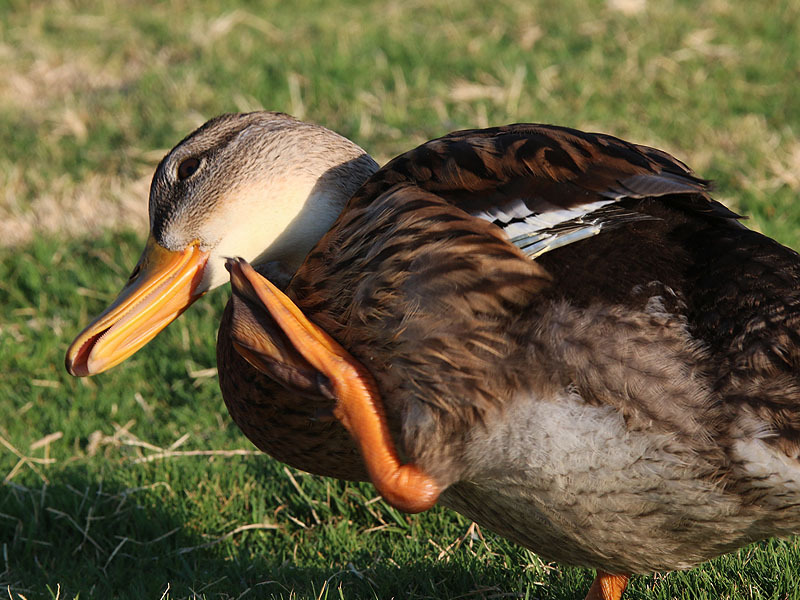 A juvenile Mallard scratching an itch. 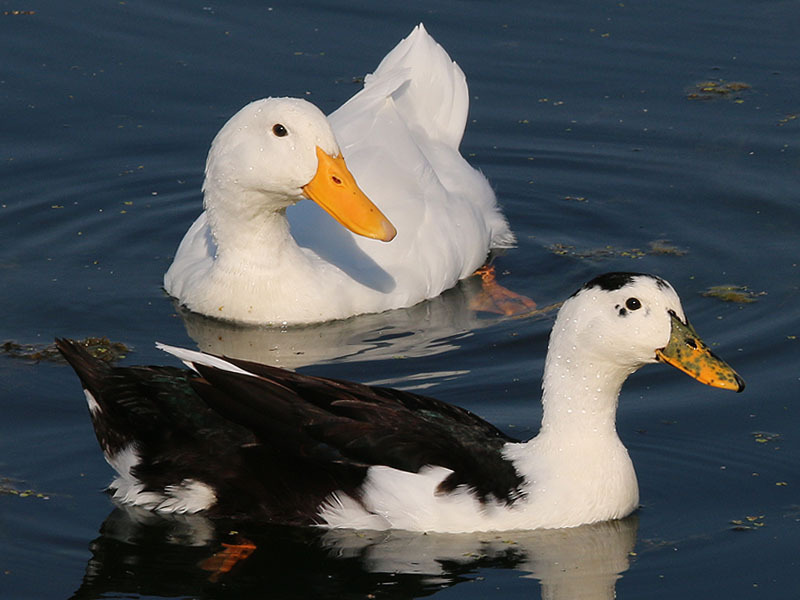 Two domestic ducks. A Pekin (back) and a Magpie (front). Nutria at this park are very numerous and very bold. They—like the wild ducks—have learned that visitors to the park often come with gifts of bread. The Nutrias can frequently be seen swimming through the water or feeding on green clover on the grassy banks of the lake. 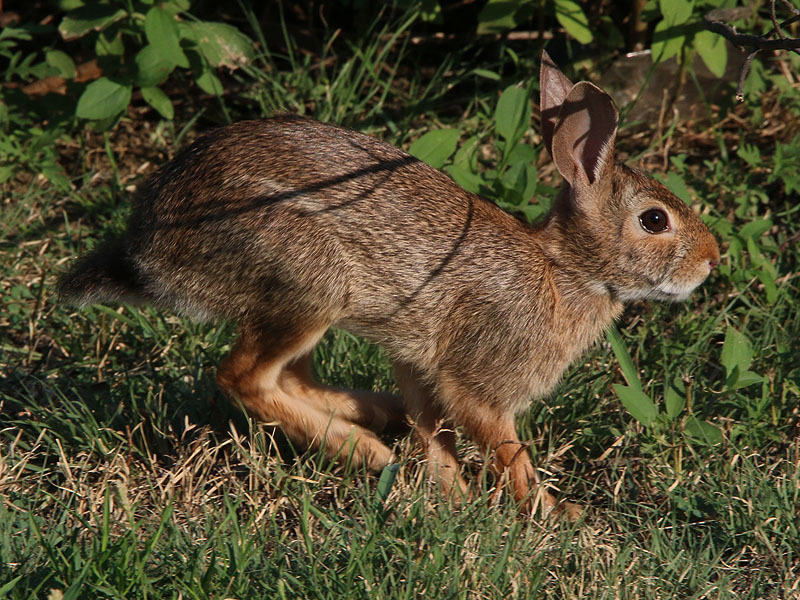 Eastern Cottontails are also to found in abundance along certain parts of the parks trail system. 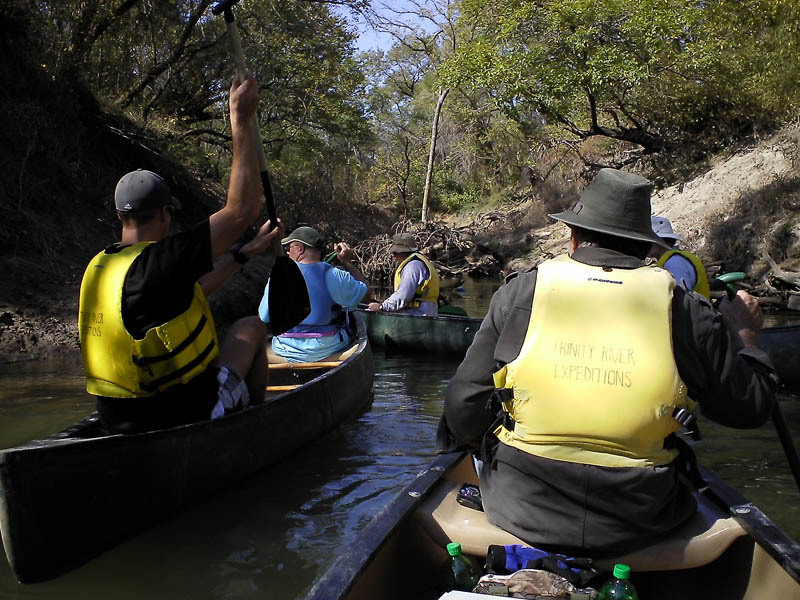 These charming little guys are tolerant of observation, but they are not quite as bold as the resident Nutrias. Observing the rabbits for too long or from too close will send them scurrying for cover. 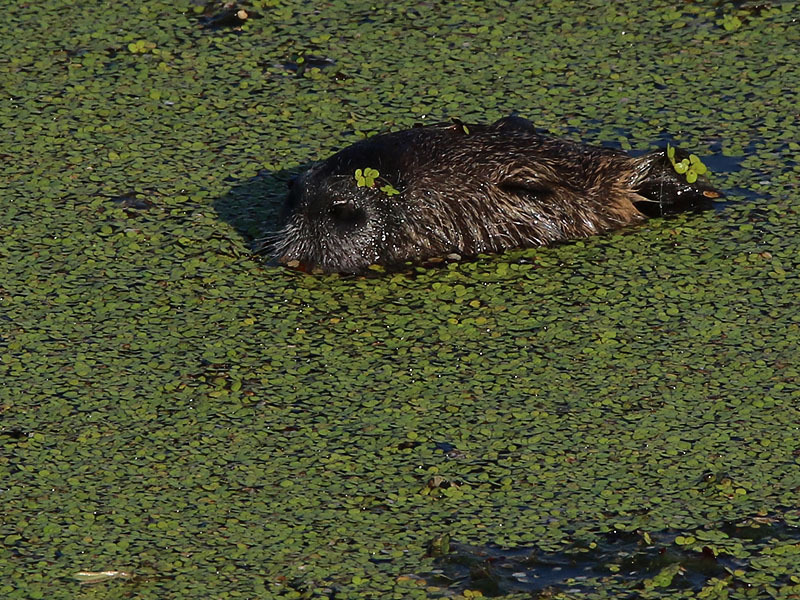 A Nutria dozing in the duckweed. You may remember from a few weeks ago the snippet I did on a pool of water containing a dozen or so stranded fish. The unique situation had attracted a number of hungry snakes to the water, and I filmed many of them as the snakes did their best to hunt the hapless fish. As you can see in the photograph below, the water and fish are long gone. 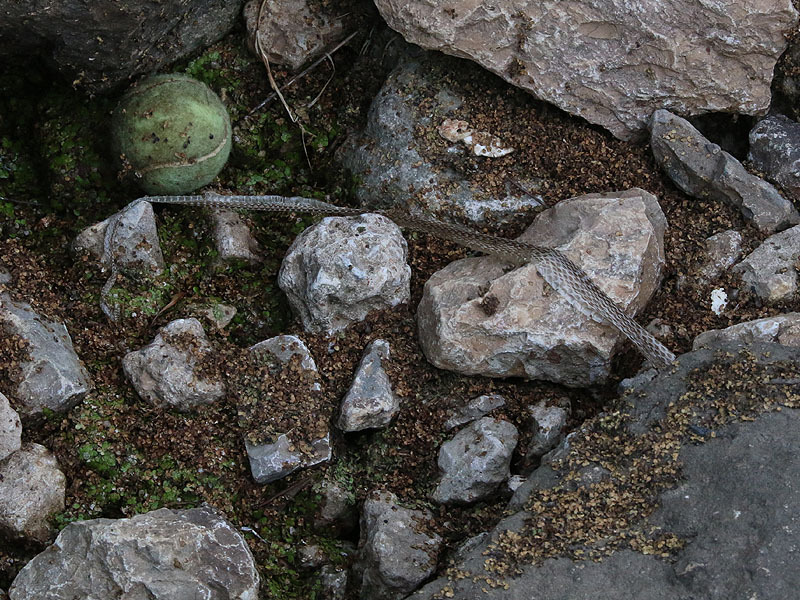 But it appears from the shed skin that the snakes are still around. 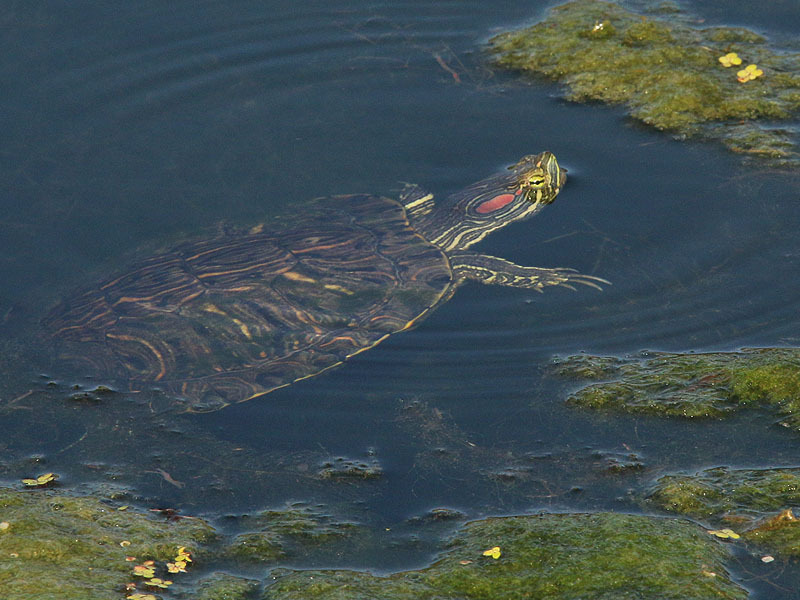 Other reptiles present this afternoon include the ubiquitous Red-eared Slider (another animal that has learned to come forward when people show up with bread), and a huge female Spiny Softshell Turtle basking on the concrete dam. 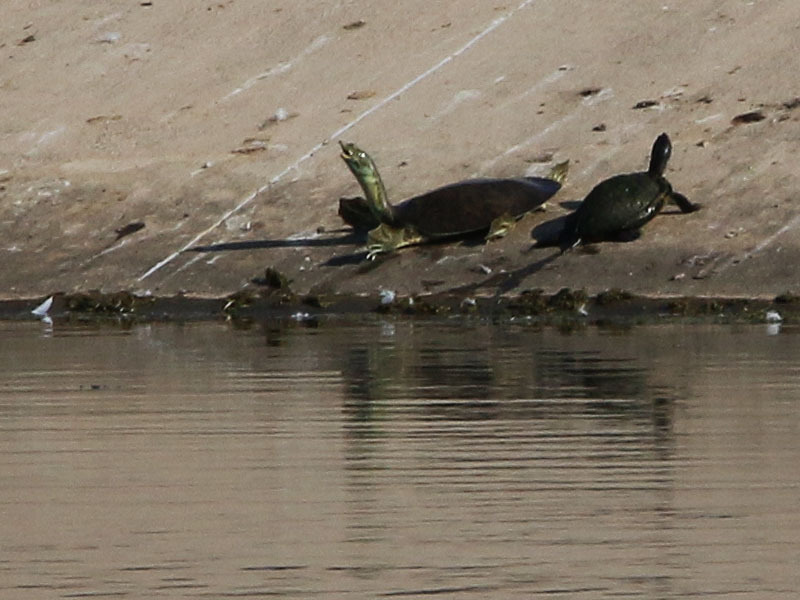 A spiny Softshell Turtle (left) with what looks to be a Red-eared Slider (right). The swan story is so sweet! 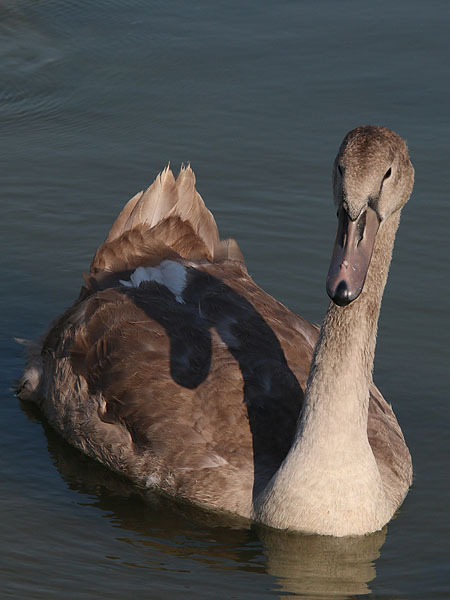 Seeing the cygnet grow up is beautiful and the cygnet has some great parents! All the pics are fantastic! Love all the updates and information you provide!